Nestled by a river among rolling hills, the little town of Inistioge is a favoured romantic hideaway for many Irish people and those who discover this special place tend to be drawn back again and again. It’s a small pretty village, somewhat off the beaten track, where little has changed for generations and the modern world seems very far away indeed. The movies “Circle of Friends” and “Widow’s Peak” were both made in the village, bringing such stars as Minnie Driver, Mia Farrow, Chris O’Donnell, Adrian Dunbar and Joan Plymouth to town. Mary Tighe, who lived at Woodstock Estate, published in 1805 a version in translation of the 2nd century poem “Cupid and Psyche”, called “Psyche, or the Legend of Love“. It is rather turgid stuff to the modern ear, but was extremely popular in its day, ran to 6 editions and won the admiration of, among many others, the poet John Keats. For now, a short extract may get you into a romantic mood! Mary Tighe was buried in St Mary’s Church in Inistoige where there is an effigy of her in the tower. On a recent trip to Italy I came across a statue of her in the Galleria dell’Accademia in Florence, to my enormous surprise and great delight. The River Nore winds through the village and the surrounding countryside and a has riverside footpath. The best views of the river and the valley are from Woodstock Estate, high on a hill above the village. The remains of Woodstock House are a stark reminder of a rather inglorious period of Irish history, when during and after the Irish Civil War many great old house were burnt to the ground. The estate covers about 1000 acres including 50 acres of gardens, and has splendid walks. The gardens and woodland walks were created between 1840 and 1900 and as well as native species contain many exotic plants from Asia and South America. There has recently been quite a lot of restoration work carried out on the gardens and it is a wonderful place to explore at any time of year. Look out in particular for the Monkey Puzzle walk and for the lovely old dovecote. St. Mary’s is a pretty church in the centre of the village parts of which date back to the 13th century. The ruins of a 14th century merchant’s house overlook the tree lined village square and there is a nice little garden there where you can sit and watch the world go by. On a rock above the river are the remains of a Norman motte and bailey castle. Kilkenny is nearby and a good day out, with its castle and meandering streets and lanes. But really, Inistioge is mostly about relaxing and not doing very much at all. At the Gate Lodge at Berryhill, just outside the town, there are wonderful views over the fields to the river below, and open fires to curl up in front of in the evenings. The Woodstock Arms, in the village, is a nice pub with good rooms overhead. In the village, Circle of Friends (056 775 8800) is a cafe by day and a bistro by night and serves good value food in a cosy dining rooms in a lovely old house. The Motte, (056 775 8655), in an 18th century lodge at the edge of the village is more upmarket and extremely good. The Woodstock Arms, Lenihan’s and O’Donnell’s are all good and friendly pubs. Inistoige is about halfway between Kilkenny and New Ross in South East Ireland. I have just discovered that my great-great grandfather, James Grace, was born in Inistioge (circa 1845). I am visiting in October with my husband and Dad, we are really looking forward to it. What a beautiful village! My Father and his family are from Inistioge (Hackett) I was lucky enough to meet some of my family that still live there today. when I was younger I stayed in my fathers childhood home. He always speaks so fondly of Inistioge it is a magical place, that I hope to visit again. Hi Sharon, how are you? I would love to visit inistioge. However, it is winter time. I m wondering if still possible to visit the enhanced forest in January? I mean if is it open for visitors? i love to go on google map and show everyone the village i come from it takes me from the school in inistioge right up to bottom of the lane i lived in in killeen people asks me why i left such a lovely place i know it was work and no transport those days still i go home often i stay with family in bennetsbridge which is another lovely place but theres no where like killeen exceptfor the big ugly shed in one field WHY????? Glad to see so many people love Inistioge as much as i do, I’m originally from Kilkenny City but whenever i get a chance to get home I like to stay down in Inistioge as its very tranquil and peaceful but still has everything you need in a good village. I normally stay in the Woodstock Arms B&B on the square as its central, has an excellent breakfast and has a good bar to boot! We took a wrong turn coming out of New Ross and decided that instead of heading for the motorway we would go the scenic route. What a stroke of luck that was, we would never have stumbled upon this stunning little village otherwise. We were just awestruck with the beauty of the place and stopped to take photographs and spent a couple of hours exploring. We loved the place and intend to return to spend more time there. We got to see around the whole village and the beautifully restored St Comilcille’s RC Church but were disappointed that we were unable to get into the neighbouring St Mary’s C of I which was every bit as beautiful and perhaps a little more interesting with its 13th century history. Also bought two dvds that were filmed there, looking forward to watching these. Inistioge, my home away from home. My Lavin ancestors are buried in the Clonamery Church. Annette Ashe, your Father was very kind and accommodating on my first visit 10 years ago. Purchased the heaviest doorknocker from among the bric-brac. Hello to Kitty Drea and Ed Cody as well! Hi Arnold, please reconnect with me, I’ve lost your email address when computer went down.. getting our Lavin photos online for nephew, who is getting married on the Cape, in a few weeks. I am from Inistioge myself just a little out the road from the village itself, Margraet and Mark will be happy to know that work has started on the church itsbeen going on for a couple of months now, they’ve cleaned the outside, tidied the yard, gave it a paint job, cleaned the windows, replaced the seats and a new preist to go with the new look. I would like to take this chance and invite you all to our second ever Saint Patrick’s Day parade,our first one was a great sucess and laugh, hope to see a bigger turn out this year. The floats are home-made by locals with local kids and groups particapating. All are welcome and invited, we’re hoping to make it an annual thing and with every year we’ll get better! I live in Inistioge so of course I am biased. We have the bic-brac shop and it,s wonderful meeting people from all over the world who visit us each year. My dad is 91 now and has been running this little shop since november 1981. Both he and my mum moved to the village that year to start the business as a grocery and sweet shop. They were farming UP TO then so as you can imagine this was a big change for them! Those first few few years were so busy when there were very few big stores ,no Lidl,Tesco or even Super valu. It was all very exciting for us as teenagers especially in the summers with the volume of visitors coming to the village as well as the crowds around for the Vintage Rally which is still a yearly event . Inistioge is a beautiful little village and very welcoming to all its visitors so do make sure you put it on your list of places to visit when in Ireland! I wrote to you prior to my trip to Ireland last month. I was hoping to get to meet you while I was there. I was in Ireland for 2 weeks and it was everything I had hoped and dreamt it would be. I came on an ancestry search. My great, great grandfather was born and raised in Inistioge. I never got there, for many reasons, until my last day in Ireland. It was so unbelieveable for me to stand atop Woodstock Gardens and look down into the valley he grew up in. Words could never describe how I felt. Since I was only able to spend about a half a day there. And the driver only stopped at Woodstock and then I was able to get out at the School Cafe and take pictures. Needless to say, that was not enough. So I made reservations to spend a few days in Inistioge next July. I am so excited already! I sure would love to hear from you. My e-mail address is: merrimanbr@comcast.net. Hello Annette, I have just seen your sight message. I am a member of the James family from Killeen. I visited your father’s shop a few years ago and had a wonderful chat with him. He told me that some member of his family nearly became my uncle’s wife ! William James. I was in Killeen twice this summer to visit family graves and go up to the old home in Killeen….sadly no longer in the family. My cousins,from Killeen,( Hynes ) who now live in the ( UK ) still visit me in Wicklow. Best Wishes, Susan. My wife and I have visited this lovely town twice and plan to visit again this year. The first time we ate at Circle of Friends they were out of Banoffee pie. The second time we were there we told them the story and the gave us the biggest slice on the house! Now that is hospitality! Inistioge, I believe that if you visit this very beautiful village you will remember it forever. It is magic and it really leaves a feeling of calm within. If you have not been to Inistioge you have missed something special. My Family are from Killeen, Just outside as margaret posted. It’s a Stunning little place, Again the chruch needs some investment. Other than this, when i go home to ireland, we always spend time there. I visit Inistioge whenever I’m in Ireland. The village is one of Ireland’s prettiest. There’s a little cafe right in the park that serves delicious apple pie. Years ago there was a young couple that made beautiful pottery in town as well. Unfortunately, they are no longer there. We spent two nights in Inistioge. I highly recommend the Woodstock Arms B & B. We enjoyed dinner at the Circle of Friends and Footlights by the River. Both excellent. Our favorite by far was Footlights by the River.It has only been open about 6 months, but Justin and his mom do an outstanding job. The food was outstanding and the conversation with the owners and locals was just as great. Inistioge is about 15 mins. outside of Kilkenny and is a wonderful quiet spot to relax in the evening and still close enough to visit Kilkenny. Inistoige was our favorite stop in Ireland. Woodstock is beyond description. It was like being in an enchanted forest. I almost hesitate to tout it’s virtues since part of the charm was being alone amongst the giant ferns and fantastic trees. my son has just come home from my nans memorial mass in inistioge and margaret you wiil be delighted to hear the church is refurbished.he said its lovely and hes only 18.im livin in waterford but love inistioge.just need to win lotto and im livin there. 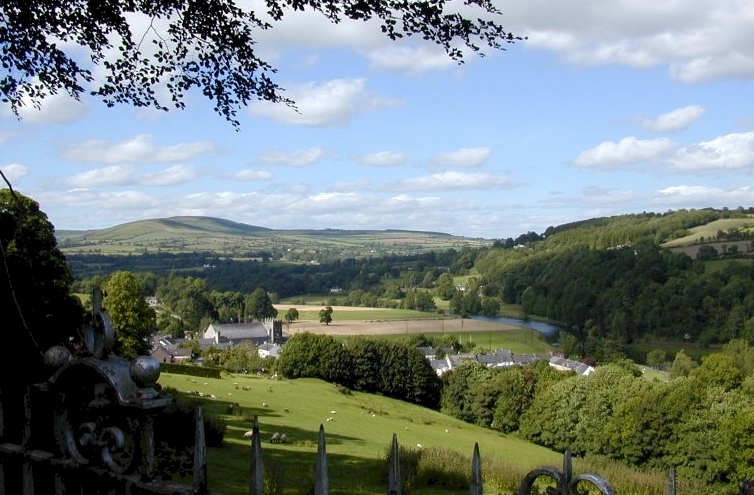 The south Leinster way and new Kilkenny – inistioge riverside paths come through the village. 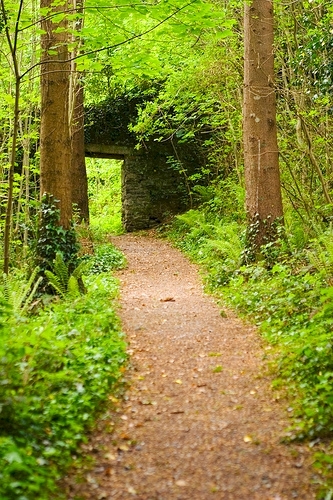 The south leinster way gets walked by about 5 people a year, so bring your wellies for a quiet walk. A short detour off the south leinster way takes you to the summit of Brandon hill for (weather permitting) fantastic views over the nore and barrow valleys, the blackstairs and coomeragh mountains and down to hook head. You might meet someone up there but it’s unlikely. You then have the choice of dropping back to Initioge or Graig for dinner (i’d chose the circle at Inistioge).